Dell U2717D 27 LCD Monitor 67YGV. In Easy To Open OEM Brown Box Packaging! 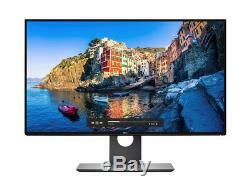 Dell UltraSharp U2717D 27 LED LCD Wide Screen 2560x1440 Resolution InfinityEdge Display Monitor. Seamless and precise: The World's first InfinityEdge Monitor has the world's thinnest borders on all sides of the screen, creating an almost seamless multi-monitor view. Designed with purpose: Multiple customization options allow you to adjust your monitor to best fit the way you work. Included: 1 x Monitor Stand 1 x DisplayPort Cable 1 x Power Cord 1 x Printer Cable. The Dell UltraSharp 27 Monitor allows you to see the bigger picture, without boundaries. Perfect for industry professionals looking to get the most out of their desktop experience. Optimize your view: Feast your eyes on the thinnest borders to ever to grace all four sides of a monitor. Dells InfinityEdge borders, which include the bezel width and inactive black space, create an almost seamless viewing experience. With 7.3mm top, left, and right sides and a bottom border measuring only 8.4mm. A more accurate display: Colors stay as precise as they can be at deltaE <2 to give you a more immersive display. And with our factory color calibration report, youre guaranteed that every monitor has a 99% sRGB coverage at deltaE <2 ensuring every color is as accurate as we claim. Stunning at every angle: Colors remain consistent across an ultrawide viewing angle, guaranteeing a dazzling display no matter how you view it. Witness the difference See more with 1.77 times the screen details on QHD resolution than Full HD. Display Diagonally Viewable Size: 68.47 cm (27 inches) Aspect Ratio: Widescreen (16:9) Panel Type, Surface: In-plane switching Type , Anti-Glare with 3H hardness Optimal resolution: 2560 x 1440 at 60 Hz Contrast Ratio: 1000: 1 (typical) Brightness: 350 cd/m2 (typical) Response Time: 8 ms (gray to gray) Normal Mode 6 ms (gray to gray) FAST Mode Viewing Angle: 178° vertical / 178° horizontal Color Support: Color Gamut4 (typical): 99% sRGB (DeltaE < 2) 16.7 Million colors Pixel Pitch: 0.2331 mm Backlight Technology: LED Display Type: Widescreen Flat Panel Display Display Screen Coating: Anti-Glare with 3H hardness Audio Output: 1 x Audio line-out Electrical Voltage Required: 100-240 VAC / 50 or 60 Hz ± 3 Hz / 1.7 A (maximum) Power Consumption (Operational): 26W (typical) / 23.7W Energy Star / 74W (maximum)5 Power Consumption Stand by / Sleep: Less than 0.5W / Less than 0.3W. Connectivity DP connector (include DP in and DP out) mDP connector HDMI (MHL) connector. Size and Weight Dimensions with stand (H x W x D): Height: Compressed : 410.2 mm (16.15 inches), Extended : 540.2 mm (21.27 inches) Width: 611.3 mm (24.07 inches) Depth: 200.3 mm (7.89 inches) Dimensions without stand (H x W x D): Height: 355.6 mm (14.00 inches) Width: 611.3 mm (24.07 inches) Depth: 48.3 mm (1.90 inches) Weight: With packaging: 9.9 kg (21.83 lb) Panel only: 4.5 kg (9.9 lb) Preset Display Area(H X V): 569.736 mm x 335.664 mm 22.43 inches x 13.21 inches. The advertisement of any product does not constitute an offer to sell. Your order does not signify our acceptance of your order, nor does it constitute confirmation of our offer to sell. We reserve the right to accept or decline your order. Ambiguity: In the event that something may seem ambiguous to you or you think we made a typo or a mistake. This agreement shall be construed under and in accordance with the laws of the state of Ohio, and all obligations of the Parties created in this Agreement are performable in Lake County, Ohio, United States of America. Powered by SixBit's eCommerce Solution. The item "DELL ULTRASHARP U2717D 27 IPS LED LCD 2560X1440 INFINITYEDGE DISPLAY MONITOR US" is in sale since Friday, January 18, 2019. This item is in the category "Computers/Tablets & Networking\Monitors, Projectors & Accs\Monitors". The seller is "ascendtech" and is located in Cleveland, Ohio. This item can be shipped to United States, Canada, United Kingdom, Denmark, Romania, Slovakia, Bulgaria, Czech republic, Finland, Hungary, Latvia, Lithuania, Malta, Estonia, Australia, Greece, Portugal, Cyprus, Slovenia, Japan, Sweden, South Korea, Indonesia, Taiwan, Belgium, France, Hong Kong, Ireland, Netherlands, Poland, Spain, Italy, Germany, Austria, Bahamas, Israel, New Zealand, Philippines, Singapore, Switzerland, Norway, Saudi arabia, Ukraine, United arab emirates, Qatar, Kuwait, Bahrain, Croatia, Costa rica, Viet nam.